Was Trump’s pardon of Joe Arpaio unconstitutional? A small group of lawyers are fighting to find out. 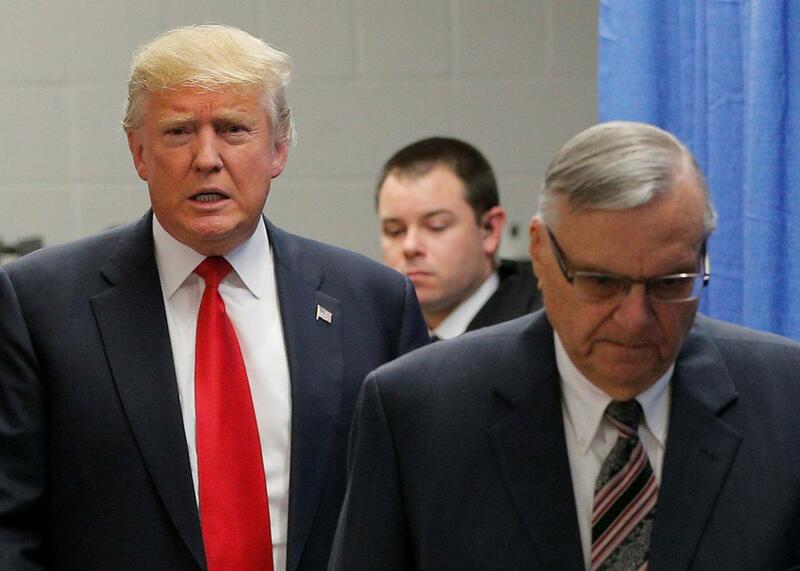 Donald Trump and Joe Arpaio in Marshalltown, Iowa, on Jan. 26, 2016. Sometimes it’s easy to believe that the only lawyers trying to hold the Trump administration in check work for Bob Mueller. But keep your eye on the other attorneys who keep popping up in unlikely places. This week, they migrated south to a federal court in Arizona to try to slap back the obscene pardon that Donald Trump recently handed out to one of his vilest cronies. In July, former Sheriff Joe Arpaio was convicted of criminal contempt for willfully violating a 2011 court injunction barring his Maricopa County officers from stopping Latino drivers solely on the basis of suspicion that they were in the country illegally. In his 24 years as the state’s most powerful local law enforcement officer, Arpaio reigned over a Bermuda Triangle of civil rights violations. He incarcerated suspected “illegals” in a tent city, forcing them to wear pink underwear and live in intolerable weather conditions. His inmates died, gave birth in restraints, and were underfed and humiliated. And Arpaio preened and boasted while leaving hundreds of reported sexual assault cases unresolved. Trump pardoned Arpaio on Aug. 25 as he awaited sentencing for his contempt of court, referencing his work “protecting the public from the scourges of crime and illegal immigration.” The pardon wasn’t just a rejection of the civil rights claims of his victims, but a shocking insult to every judge in America who has ever attempted to enforce a court order against someone who believes he answers to nobody. As Joan Biskupic wrote at the time, the American judicial branch has been largely silent in the face of Trump’s latest assault on judicial authority, even as their own power was being undermined. The courts have hung back. As the Arizona Republic explains, Bolton canceled Arpaio’s sentencing but declined to vacate the conviction altogether, instead ordering Arpaio and Department of Justice prosecutors to file briefs on the matter. This week, federal prosecutors who had won that conviction for criminal contempt against Arpaio switched course and dropped the case against him entirely, claiming Trump’s pardon had resolved the matter. When the DOJ stepped back, a small army of legal advocates stepped in, filing a raft of briefs seeking to have Bolton reconsider tossing the case, with some arguing that the pardon itself is illegal. This began with an effort spearheaded initially by Ron Fein, the legal director of Free Speech for People, who co-authored a letter last month to the Justice Department asking them not to vacate the conviction. No President till now has proclaimed that a public official who violated the Constitution and flouted court orders was ‘doing his job.’ The purported pardon is an attempt to exercise a power that even the King of England did not possess in 1787. If the President may employ his pardon power to relieve government officers of accountability and risk of penalty for defying injunctions imposed to enforce constitutional rights, that action will permanently impair the courts’ authority and ability to protect those inalienable rights. The result would be an executive branch freed from the judicial scrutiny required to assure compliance with the dictates of the Bill of Rights and other constitutional safeguards. Like other prerogatives assigned to the Executive Branch, the pardon power cannot be read to negate other provisions of the Constitution. The President could not, for instance, declare pardons for all white people and only white people who had been or might be convicted of federal gun offenses. That would fail to read the pardon power in harmony with the Equal Protection Clause. Similarly, here, the pardon power in Article II must be read in harmony with the later-enacted Due Process Clause. These parties are all aware that this situation has little legal precedent. They understand that the pardon itself has little historic analogue. They see this as a feature, not a bug. As Protect Democracy puts it, “We are aware of no case in this Court, the Ninth Circuit, or the Supreme Court that has upheld a pardon matching the extraordinary circumstances here, where the contempt is used to enforce court orders protecting the rights of private litigants.” They contend that the fact that nobody truly understands the boundaries of a constitutionally intolerable pardon allows the parties to argue for that redress in Bolton’s courtroom. In light of the Sessions Justice Department’s about-face in this years-long litigation, Protect Democracy entered another filing Tuesday morning asking Bolton to appoint a private attorney on behalf of all the amici to argue against vacating Arpaio’s conviction. They contend that the federal rules of criminal procedure call for such an appointment if the executive branch won’t prosecute the case. There is certainly an argument to be made that Judge Bolton does not want her courtroom to become the place in which a roomful of lawyers litigate the constitutionality of the president’s pardon power. But as this fleet of lawyers has now carefully articulated, for the founders’ vision of checks and balances to prevail, there needs to be some room somewhere in which the insanity that is Trump law is litigated. Jennifer Rubin makes the point that these filings are certainly a legitimate forum in which to challenge Trump’s pardon of Arpaio, which she says violates his oath of office by signaling that no friend of the president is bound by the rule of law. As such, these filings form the very spine of an impeachment claim against the president. Rubin adds that these legal pleadings may also sound a warning to any Trump team member facing prosecution: The road to a blanket pardon may not be as smooth as they currently believe. In case this all seems of limited consequence to Judge Bolton or the rule of law, another filing by Arpaio’s lawyers came in Thursday evening, seeking to deny yet another Amicus brief on behalf of Arpaio civil rights victims. Arpaio’s lawyers now complain that his contempt conviction was for violating court orders in an “ambiguous” area of law about what constitutes “cooperation” with the Department of Homeland Security. His lawyers here argue for the presumptions of innocence and lenience for Arpaio—presumptions he never afforded his own victims. A concluding sentence, quoting Fyodor Dostoyevsky, points out that “[t]he degree of civilization in a society can be judged by entering its prisons.” Lawyers for the man whose prisoners died in restraints tells Judge Bolton that “the Court always sets its more powerful example when it follows the law to show mercy and integrity, than when it bucks the law to show pettiness or spite.” That the true victim of injustice here is Joe Arpaio is an argument that can only be advanced in this litigation, at this moment, in this America. Indicating that she was at least open to considering this, late Thursday Judge Bolton issued a new filing suggesting that she was considering dropping the criminal case against Arpaio but allowing his guilty verdict to stand. She ordered briefing on whether she has the power to vacate the conviction. Citing Nixon v. United States she wrote, “The granting of a pardon is in no sense an overturning of a judgment of conviction by some other tribunal; it is an executive action that mitigates or sets aside punishment of a crime.” At the very least she will entertain the possibility that vacating Arpaio’s conviction is not required. The predicate belief of the judicial system is that nothing should be resolved in any but the narrowest possible ways. Drama and grand gestures are anathema. The predicate belief of the Trump administration is that fomenting disruption and chaos be done on the grandest scale. Because who’s going to stop you? No courtroom wants to be the courtroom in which Trump’s upside-down legal worldview is adjudicated. But unless it’s assessed and evaluated someplace, the courts themselves will continue to be a casualty of his actions.